Hello to all of my lovely sweet friends! I am a little slow with getting this blog done today! Yesterday I put on a 5th Birthday Party for my little girl Bella Rose. It was a lot of fun but a lot of preparation! I also had a very big drama when doing her cake! She was trying to help and was leaning over the mix master! Her beautiful long hair that has been only cut once since she was born was caught in the beaters. She was screaming and I was crying as we cut her free! I can laugh now but It was very upsetting at the time. We had to redo the cake mixture and start again! It turned out all right in the end! She had a lovely party with her little friends from Preschool, Dancing and Music! 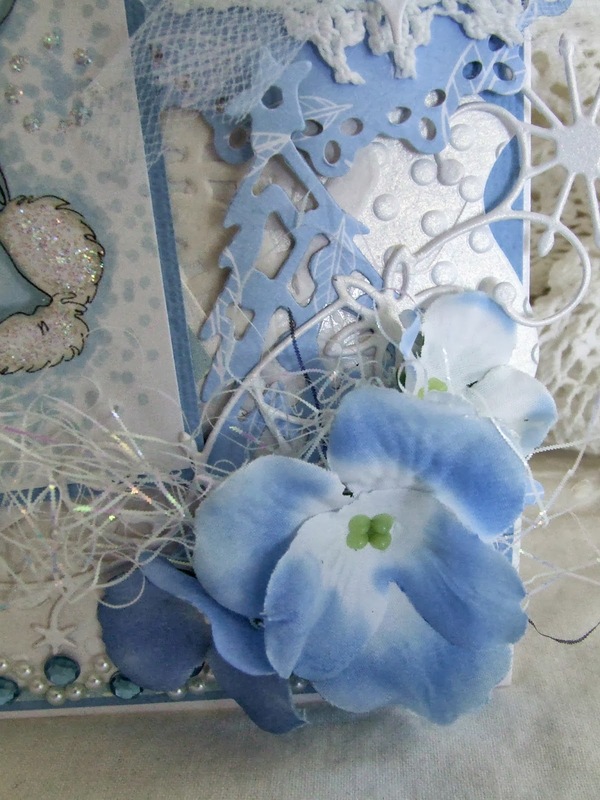 I have a new card to show you today for the New Challenge over at the Aussie My Besties Challenge Blog. The theme for this new challenge is Use White on White and One other colour! I think this cute little Bestie is so sweet! 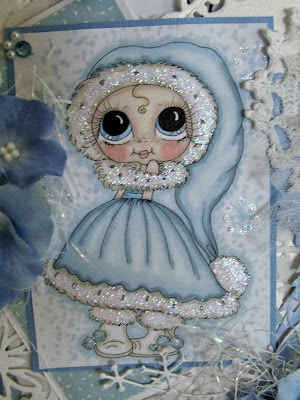 She is one of the new Christmas Range and is available HERE . I have coloured her with my Promarkers and added a lot of stickles to give her lots of sparkle! I used a Rub on on a lovely tag that I had in my stash! Paper doily and crocheted Doily and also various die cut doilies sit behind. I have used some fabric Hydrangea Flowers from my stash on this card as they were the perfect colour! Over the top of my Marianne Designs leaf flourish! I also used a bit of crystal shred! The Noor Design Butterfly Border is peeking out! 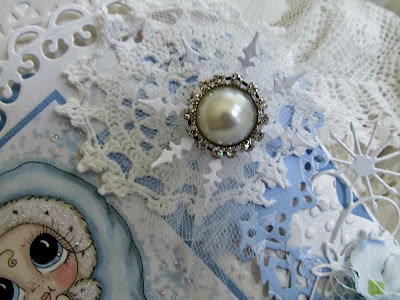 You can just see a Marianne design Christmas tree die, Memory Box Snow Flourish, and Pearl bling! I hope you all like my Design! Wow! This is an amazing card with so many pretty details. Love all the bling! Thanks so much for playing along with 52CCT this week! BTW - pleased that the birthday cake came out okay in the end - love the photo! Not sure which is more delicious--the cake or your card! Your colouring is exquisite--I would frame this card--its a work of art. Thanks for linking up with the Color My Heart dare this week. What great colors. Love the winter look and your beautiful coloring. Fabulous sparkle and bling on your sweet image. Thanks for linking up with Color My Heart this week! What an adorable card! I love your coloring and your overall card composition. Thanks for playing along with us at Color Me Creative for our anything goes challenge. so sweet! 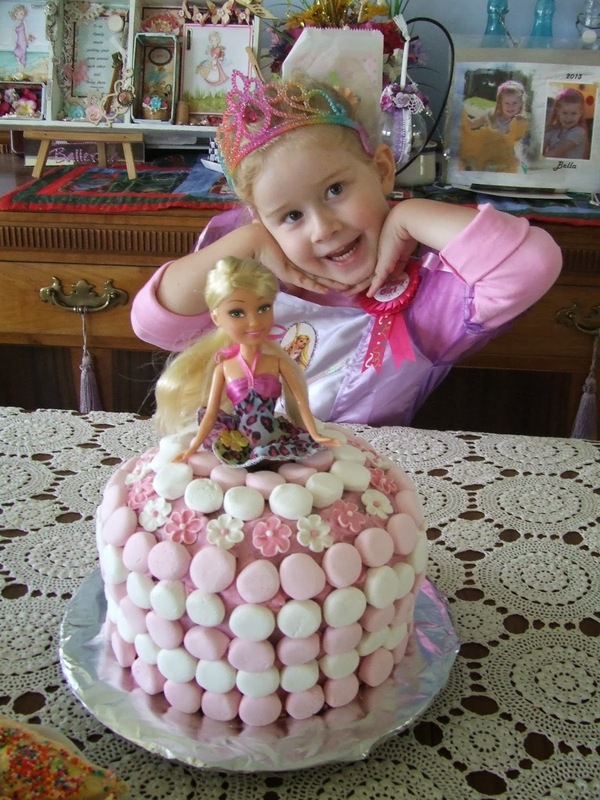 Love all the embellishments and the cake looks fabulous too! Thanks for joining us at Sweet Pea Stampers! oh Wow! So so beautiful. That is one darling image for sure. thanks so much for joining us this week at 52CCT! Stunning! Beautiful colouring and amazing detailed work. Thanks for taking this week's Color Dare. In this card, more is more! I love all the layers of textures. Thanks for joining this week's Color Dare. wow that card is really stunning!!! Love all the great embellishments you have added. What a story that you will have forever now.. and it's a good thing it ended up being ok.. and hair will grow back... The end cake turned up gorgeous!!! Wonderful design! I love the color palette and how perfectly the color is integrated throughout the design. You have colored the image quite well and the stickles really take the design up a level. Very nicely done! Thanks for leaving this beautiful project on our front porch here at 613 Avenue Create. 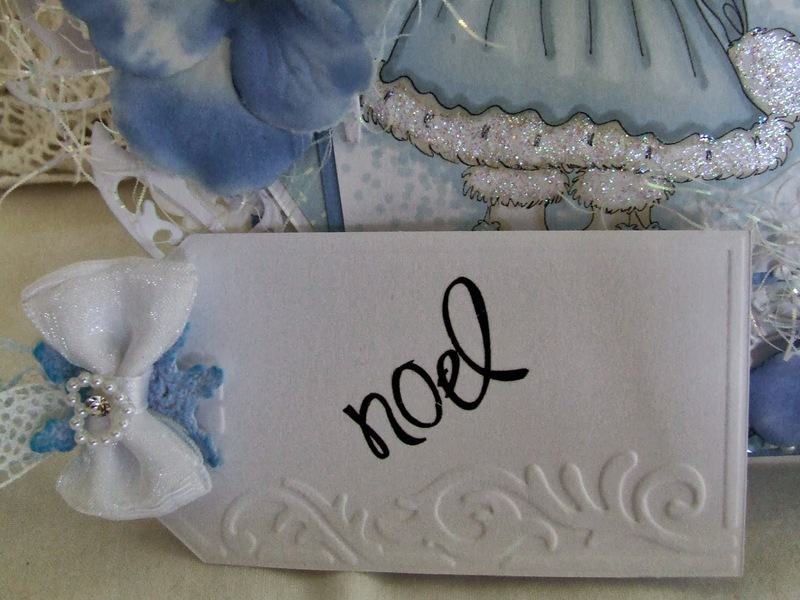 Thanks for joining our sparkle and shine challenge at The Sweet Pea Stampers. Love all the bling on the fur! Thanks for playing at Color My Heart and 52CCT this week! This is so adorable :-) Love all the details and the blue colors. So, so pretty! I love your cards..every time i see one! Beautiful! What glitter do you use?